While some of you may be lucky enough to enjoy outdoor BBQ temps year round, not all of us are that lucky. So when the days get shorter and sweater weather creeps up, many will have to move their parties inside. However, just because your guests will be walking on a sidewalk scattered with fallen leaves up to a porch decorated with pumpkins, there’s no reason to totally abandon your go to ingredients from the past few months. It is possible to serve an array of dishes that embrace the delightfully cozy, cool weather upon us now and the flavors from the summer state of mind we want to hang on to 365 days a year. For your next party, fall into this amazing menu that still feels like a vacation in every bite. While these oysters are best enjoyed on the beach around a fire built from driftwood, they can also be made under the intense heat of a broiler. And while oysters are available all year, they are best eaten in the colder months. You can also substitute a bourbon-chipotle butter for the tarragon butter (simply mix 1 minced chipotle pepper and a splash of bourbon into the butter). Place the butter, salt, pepper, tarragon, marjoram, and vinegar in a small bowl and use a fork to mix everything together. 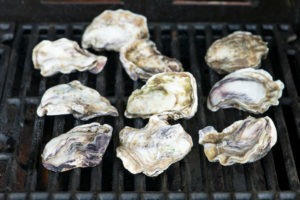 Place the oysters on the hot grill, rounded-side down, and cook until they pop open, about 3 minutes. Carefully remove the oysters from the grill and pry off and discard the top shells. Divide the butter among the hot oysters so it can melt directly on top of the oysters. Serve immediately, with lemon wedges for squeezing over. Making this bisque is a lesson in old-school cooking. The homemade stock gets mixed with sherry, cognac, and cream. 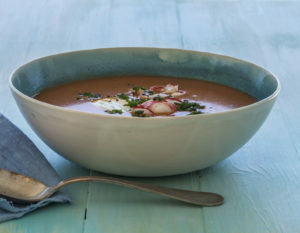 Layer upon layer of flavor, this bisque is what to make for someone you want to impress or just show how much you care about them. Note that the xanthan gum works as a wonderful stabilizer and keeps the bisque very smooth and creamy (it’s widely available at stores like Whole Foods and Trader Joe’s). If you can’t find it, though, just substitute 2 teaspoons cornstarch mixed with 2 tablespoons cold water. Place the stock, sherry, and cognac in a large pot set over high heat and bring to a boil. Boil for 4 minutes to cook off the alcohol and then reduce the heat to maintain a simmer. Stir in the tarragon, cream, butter, and xanthan gum. Taste and season the soup with salt, pepper, and sugar. Divide the soup, cooked lobster, crème fraîche, and chives between 4 bowls. Serve immediately. One of the most popular entrées at JWB, this dish is also a lesson in how to cook a piece of simple fish beautifully. The light coating of bread crumbs adds lots of texture. Season both sides of each piece of fish with 1 teaspoon of the kosher salt and ½ teaspoon of the black pepper. Place the bread crumbs in a shallow bowl and dredge the fish on both sides with the bread crumbs, pressing them into the fish so that they adhere. Shake off any excess bread crumbs. Place the grapeseed oil in a large oven-safe nonstick pan set over medium heat. Once it’s nice and hot, add the fish in a single layer and scatter the lemon slices around the fish. Cook until the fish and lemon slices are lightly browned on each side, about 3 minutes per side. Place 1 tablespoon of the butter on each piece of fish and transfer the skillet to the oven. Roast until the fish is completely cooked through, about 3 minutes. Add the Artichoke Ragout to the pan. Evenly drizzle the olive oil over the fish and sprinkle with the parsley and a large pinch of the coarse salt. Serve immediately. Place the flour and lemon juice in a large bowl with 1 cup cold water and whisk together to form a paste. Add 10 cups more water and whisk well to combine. Remove the tough dark outer leaves from artichokes. Using a serrated knife, trim off and discard 1 inch from the top of each artichoke. Trim the stems and remove the tough outer layer with a vegetable peeler. Halve the artichokes lengthwise. Use a spoon to scrape out and discard the choke from the heart of each artichoke. 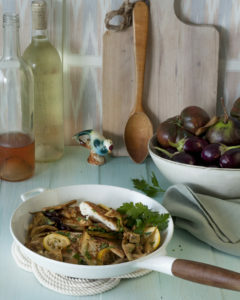 Cut the prepared artichoke halves into ½-inch slices and place them in the bowl of flour-and-lemon water as you go. Once you’ve prepared all the artichokes, drain them and pat them dry on a kitchen towel. Place the oil in the largest skillet you have and set over medium-high heat. Add the garlic and cook until the garlic begins to sizzle, about 20 seconds. Add the artichokes in a single layer (do this in batches if necessary, depending on the size of your skillet— you want the artichokes to brown, not steam). Sprinkle the artichokes with the sugar and salt and cook, stirring now and then, until deeply browned all over, about 6 minutes. Add the butter, wine, and stock and raise the heat to high. Bring the mixture to a boil, reduce the heat to medium-low, and cover the skillet. Cook until the artichokes are very tender and the liquid has reduced, about 5 minutes. Stir in the olives and parsley and season the artichokes with salt. Serve immediately. While we fry these at JWB, a very hot oven crisps them just as well at home, and you don’t have to worry about navigating a big pot of oil (plus, they’re healthier). If you’d like to fry them, though, go for it! Get a big, heavy pot and use a neutral oil such as canola for frying. The pungent fish sauce mixed with bright lemon juice and salty Parmesan cheese gives these sprouts so much depth and makes them addictive. If you like, you could top these with some cooked, crumbled bacon (six slices should do) or crispy cubes of pancetta. Place the Brussels sprouts on a sheet pan. Drizzle with 3 tablespoons of the olive oil and sprinkle with the kosher salt. Use your hands to mix everything well. Roast the sprouts, stirring them a few times while they cook, until they’re dark brown and crispy at the edges, about 20 minutes. Meanwhile, place the remaining ¼ cup olive oil in a large bowl and add the lemon juice, fish sauce, and red pepper flakes. Whisk well to combine. 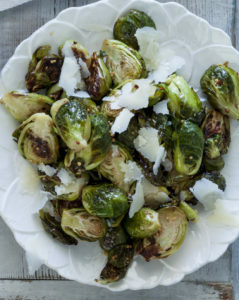 Transfer the crispy sprouts to the dressing and add the Parmesan, flaky salt, and pickled mustard seeds. Toss well to combine and then transfer to a serving platter. Serve immediately. Warning: this is an adults-only cake (and it is sooo good). 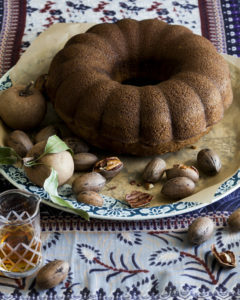 It’s basically a pound cake infused with rum. Lots of rum. Be sure to spray your Bundt pan well with baking spray so the cake will come out easily. If you have any trouble getting it to release, it can be helpful to put it in a 300ºF oven for about 10 minutes to warm up. Serve this on its own with tea or coffee (or more rum!). While slices are wonderful unadorned, they’re really nice topped with whipped cream and fresh raspberries. Preheat the oven to 325ºF. Spray a Bundt pan with baking spray. Place the flour, cornstarch, baking powder, and salt in a large bowl and whisk together. Set aside. Place the butter and granulated sugar in the bowl of a stand mixer fitted with the whisk attachment (or use a large bowl and a handheld mixer or a whisk and some elbow grease). Beat on medium-high speed, stopping to scrape down the sides now and then, until light and airy, about 2 minutes. Add the eggs, milk, vegetable oil, vanilla, and 1 cup of the rum and beat until thoroughly combined, about 30 seconds. Add the dry ingredients to the wet ingredients and use a rubber spatula or a wooden spoon to mix everything together well. Transfer the batter to the prepared Bundt pan. Bake until golden brown, firm to the touch, and a toothpick inserted into the center comes out clean, about 45 minutes. Place the cake on a wire rack. Meanwhile, place the remaining ¾ cup rum in a small bowl with the brown sugar. Whisk until the sugar has dissolved. Use a skewer or a chopstick to poke at least 36 holes in the cake. Evenly pour the rum–brown sugar mixture over the surface of the cake. Let the cake cool to room temperature as it absorbs the syrup. The cake is best if you let it sit overnight at room temperature. Run a butter knife around the edges of the pan to loosen the cake and carefully invert it onto a serving platter. Cut into wedges and serve. If you’re thinking ahead, this is a great make ahead recipe you can have ready for the morning after your party. Baked almost like a bar cookie and cut into squares for serving, this oatmeal is portable and can be enjoyed it at room temperature or just warmed up. In other words, you can make a batch one day and have breakfast for the whole week. Served warm with a scoop of ice cream, these are also great for dessert. Preheat the oven to 350ºF. Spray an 9-inch by 13-inch square baking pan with baking spray. Line the bottom with parchment paper cut to fit and spray that, too, just to be safe. Place the oats, salt, cinnamon, and baking powder in a large bowl and stir to combine. Add the brown sugar, eggs, milk, and vanilla and stir well. 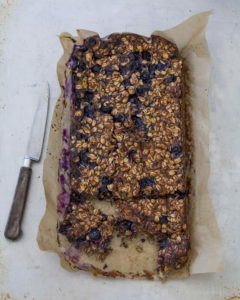 Stir in the blueberries and coconut. Transfer the mixture to the prepared baking pan and spread it into an even layer. Bake until the oatmeal is firm to the touch and light golden brown on top, about 25 minutes. Let the oatmeal cool in the pan for at least 15 minutes, then transfer it to a cutting board. Cut it into 9 even squares. Serve warm or at room temperature. Leftovers can be stored in an airtight container in the refrigerator for up to 3 days or wrapped well and frozen for up to 3 months (defrost and warm in a toaster oven before eating). And since you’ve worked so hard cooking, simply pair these courses with your favorite wines from St. Somewhere. 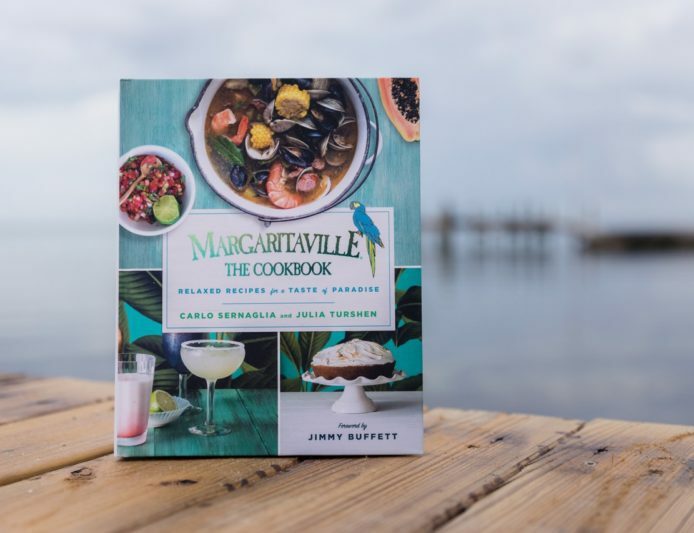 For more relaxed recipes for a taste of paradise, get your copy of Margaritaville: The Cookbook today, available wherever books are sold.